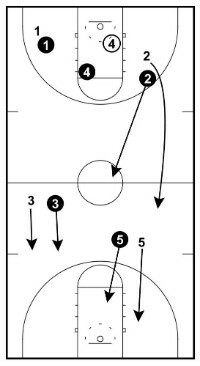 The ‘Run and Jump defense’ is a full-court man-to-man press with rules that encourage jump-switching and trapping. It was first created by Dean Smith at North Carolina during the 1970’s. 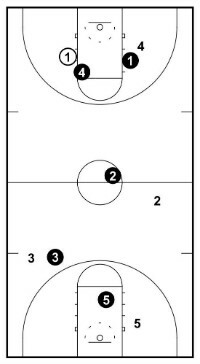 Unlike most other full-court defenses, there are no set spots on the court for trapping and switching. Rather, the players make their own decisions where to trap and switch based on a few simple rules. The defense is effective because it forces guards out of their comfort zones with high amounts of ball pressure and then uses switching and blind-side traps to create turnovers. The last thing you must remember about this press is that it’s a man-to-man press; not a zone press. Players do not guard zones on the court, they guard players. What is a ‘Jump Switch’? Before we dive into how to run the defense, let’s talk about a very important defensive movement that not all coaches will know about… a ‘jump switch’. A jump switch occurs when an offensive player dribbles towards a help defender and the help defender decides they’re going to ‘jump’ them. By jumping them, the help defender quickly closes out in the path of the dribbler with high hands forcing them to either stop the dribble, change directions, or throw a tough pass that the defender hopes to deflect. When the help defender commits to ‘jumping’ the player with the basketball, they must call out ‘Jump! or the on-ball defenders name’. This tells the current on-ball defender to switch onto the player the help defender was guarding. 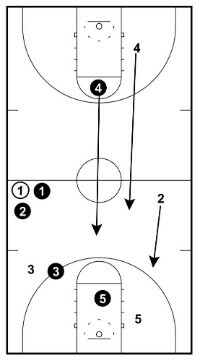 The switching player must immediately turn and sprint to guard the open player. As they pass the player jumping the basketball, the switching player must extend a hand into the passing lane in hopes of getting a deflection and a steal. Once they’ve closed the gap and determined the pass won’t be made, they must get back into help defense position. 1. Increases the pace of the game – This is a great defense for teams that want to play fast. Running a full-court, aggressive defense allows your team to dictate the tempo of the game. 2. Based on man-to-man principles – The Run and Jump defense is essentially a man-to-man full court press with a few added rules. Your players will be working on their man-to-man principles which are important for the future success of each player. 3. Your players will have great conditioning – Since you’ll be running the Run and Jump defense every game, your players will be super fit and will be used to playing a fast-tempo game. 4. Teams can’t prepare for the Run and Jump – The Run and Jump defense doesn’t have predetermined traps and rotations, it’s incredibly hard for the opposition to prepare to play against your team. It’s unpredictable. And without the knowledge of how to run it, it’s nearly impossible to simulate in practice. 5. Causes a lot of turnovers due to confusion – The opposition will have a very hard time figuring this defense out. Since there are no predetermined traps, as long as your team rotates well you’ll find the blind-side traps and switches will wreck havoc on your opponent. 6. Forces the opponent to take quick shots – This is a great defense to run against teams that are great in the half-court. The aggressive Run and Jump defense will encourage the offensive team to shoot quicker and will keep them out of their offense when they do get the basketball to their front court. 7. The players, parents, and supporters will love it – Who doesn’t love a fast and exciting game of basketball? 8. Deep bench rotations – You’ll rotate through more of your players on the bench. More players getting quality court time is great for development and keeps everyone happy. 1. Difficult for youth players to learn – The Run and Jump defense can be difficult for youth players to learn compared to other press’s because there’s no set starting point in the press and learning when to run and jump and when to trap takes experience. 2. Your team will allow occasional layups and easy baskets – As with all aggressive full-court defenses, the opposition will occasionally break your press which will lead to their team making a few easy layups. 3. Undisciplined players can get into foul trouble – Playing aggressive on-ball defense is a skill. You’ll find that your guards can end up in foul trouble very quickly from reaching in on a trap or bumping the offensive player as they’re trying to get in front. 4. Rebounding position – If the opposition does take a quick shot, the defense often won’t be in great rebounding position while they’re still recovering from the press. 1. The players closest to the rim defends the inbounds pass after a score – In order to stop the opposition from inbounding the basketball quickly, the player who is closest to the rim after a score must put immediate pressure on the inbounds passer. 2. There are no set match-ups – Since the inbounds defender can change after each shot, that means the rest of the matchups must change too. Instead of having set match-ups, players must talk to each other and make sure the all opposition players are covered quickly. 3. Players must never be behind the line of the basketball – This rule is incredibly important to ensure that we’re in the correct position to help and to jump switch. As soon as the basketball is advanced, we must get behind the line of the basketball. In the run and jump defense, we allow the opposition to make the backwards pass. 4. Players must commit to rotations – As with any press, as soon as a player hesitates on a rotation, they’re not going to get there in time and the rest of the team will be at a disadvantage. Players have to fully commit to each rotation decision. 5. Players must not reach on traps – The goal of each trap is to make the offensive player throw a high pass to a teammate that one of our help defenders can steal. Of course, players can go for on-ball steals when it’s available, but as soon as players start seeking the on-ball steal too often, it will result in unnecessary fouls. Let the offense make mistakes. The main responsibility of the on-ball defender is to put a massive amount of pressure on the basketball. 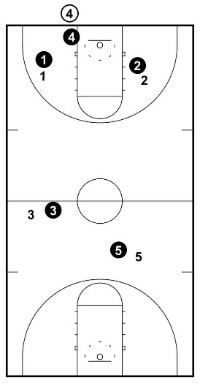 Doing so will prevent the point guard from surveying the floor or making the easy forward pass. This pressure must encourage the point guard to dribble with the aim being to force them into an uncontrolled dribble. 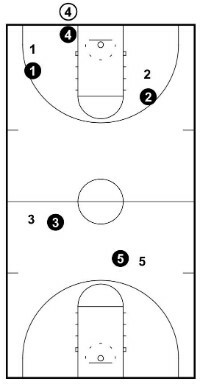 X1 must also be able to react quickly enough and be fast enough to stay on the point guard’s hip to get back in front and cut them off for the trap. If the point guard dribbles down the sideline they must chase hard and trap them on the sideline. If the point guard dribbles towards the middle of the floor they must be ready to jump switch with the on-ball defender. This player must be smart in their decision-making as they have one of the toughest roles on the floor. The other three players on the floor are initially responsible for denying the easy pass up the floor by playing their opponents side-by-side. If X1 and X4 manage to get an effective trap or confuse the defense on the switch, it is the responsibility of the other three defenders to get the steal. For this reason, they all must be continually readjusting their defensive position so that they’re in the best possible spots to rotate and intercept passes. The run and jump defense starts immediately after your team scores the basketball. A defensive player must put immediate pressure on the inbounds pass to allow the defense time to set up and also to discourage the long pass down the floor. The player that pressures the in-bounds pass should be the player closest to the ring after an offensive score. 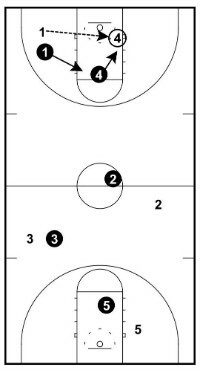 This rule is in place to ensure that the basketball is pressured as quickly as possible (x4 in the diagram). This player might be a guard after a layup or a big after your team makes an outside shot. It doesn’t matter. But if your players find themselves deciding who should guard the inbounds pass out of a guard and a post player, we would prefer the post player. It won’t always be obvious who was closest to the ring, so your players must communicate with each other to ensure someone quickly pressures the basketball. 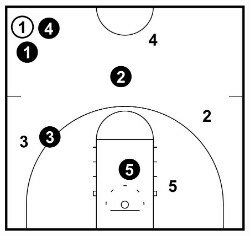 As the opposition is in-bounding the basketball, your team must have one defender pressuring the in-bounds pass, and the other four defenders should be matched up in man-to-man. The most important rule to remember on an inbounds pass is that we want the opposition to catch the basketball below the free-throw line. Preferably as close to the baseline as possible. To do this, the front defenders (x1 and x2) play behind their opponents and allow them to cut to the basketball and make the catch. If the offensive players screen for each other, the defenders simply stay behind and switch. The players that are defending at half-court should be standing on the side of their opponent so that they can pick off any passes that are made over the top of the front line. We never allow the lob pass. Once the basketball is inbounded, the player who was defending the inbounds pass must immediately get behind the line of the basketball. The run and jump defense can only be effective when the help defenders are in the forward path of the player with the basketball. This allows us to be in the correct positions to jump-switch or to trap. We don’t mind if the opposition makes a backwards pass. We simply pick the basketball up while everyone falls back into help positions again. Once the offense has inbounded the basketball and the defenders are all in the correct positions, the next step is to put a high amount of pressure on the player with the basketball. 1. To not allow the point guard to survey the floor and make a forward pass. 2. To encourage the point guard to dribble the basketball. It’s crucial to this defense that your players never allow a pass into the middle of the court. This is why all defenders near half-court should be playing side-by-side on their opposition player. Instead, the on-ball defender should influence the player with the basketball to dribble down the sideline since that’s where our traps occur. They do this by positioning themselves on the dribblers inside hip and by applying a high amount of pressure. To be clear on this important rule, it’s imperative that the on-ball defender puts a high amount of pressure on the basketball. This can be difficult for a lot of players to do because they’re scared the dribbler will get the first step and beat them off the dribble. This concern is understandable because coaches have been drilling into them for years to never allow an offensive player to beat them off the dribble. But in the run and jump defense, we want that to happen! We allow the offensive player to get the first step which encourages them to dribble down the sideline but ensures the dribbler can’t completely cut off the on-ball defender and beat them. The #1 goal is to get the dribbler into an uncontrolled dribble down the sideline leading straight into the main sideline trap! 1. The point guard reverses the basketball to another player. 2. The point guard dribbles down the sideline. 3. The point guard dribbles towards the middle of the court. 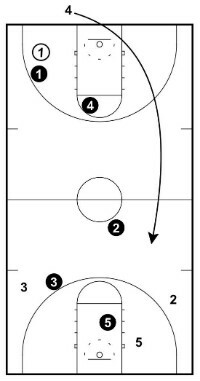 – If the point guard dribbles to the middle of the floor, it’s a run and jump. If the point guard dribbles down the sideline, the players set a trap. – There are no pre-determined spots on the court where traps or run and jumps are made. So it’s up to the players to think and make decisions. As spoke about previously, no player should be behind the line of the basketball. This means that we will allow the opposition to reverse pass to another player. This is often a good result for the defense because a reverse pass is usually made to a player that isn’t experienced at advancing the basketball up the court. Either way, all that happens when there’s a reverse pass is the help defender immediately steps up and pressures the basketball the same way the on-ball defender was, and the previous on-ball defender falls and becomes the new help defender. The best outcome is if the point guard elects to dribble down the sideline because that’s where the defense has the best opportunity to trap. As spoke about previously, this begins with the on-ball defender positioning their body so that the point guard is encouraged to dribble down the sideline. a. The on-ball defender must sprint to cut the dribbler off. While we allow the offensive player the first step, the on-ball defender must never allow themselves to get completely beat on the play. Instead, they must stay on the dribbler’s side initially and then sprint in front to cut them off from dribbling down the sideline. It’s important for the on-ball defender to ensure there’s space between themselves and the dribbler so that they’re not riding their hip up the court. This will always lead to a foul. b. The first help defender must trail and set a blind-side trap. The best player to trap the basketball on the sideline with is the first help defender. This is usually the player who puts pressure on the inbounds pass. When the point guard starts to dribble down the sideline, this help defender must immediately chase and catch up from behind to set the trap. Since the dribbler doesn’t see the help defender trailing and assumes the defense is man-to-man, this is a very effective trap. 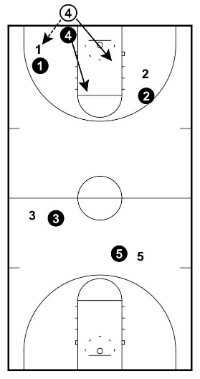 This trap can occur anywhere along the sideline but preferably happens just over half-court. By trapping there, the point guard has to make a much more difficult pass because they’re not allowed to pass backwards or it would result in a back-court violation. If the offensive player crosses over when they’re cut off by the on-ball defender, the trailing defender must attempt to tap the ball from behind. If the offensive player stops or slows down when they’re cut off, the on-ball defender and trailing defender must set a strong trap. Trapping Tip – Do not reach in and try to steal the basketball. Players that do this will foul. Instead, make the guard throw a lob pass that can be intercepted or attempt to get a deflection on the pass. c. The other three players must rotate and put themselves in the best position to steal a pass. Once the trap has been set by the on-ball defender and the first help defender, the other three players must position themselves in spots that will give them the best opportunity to intercept or deflect a pass. 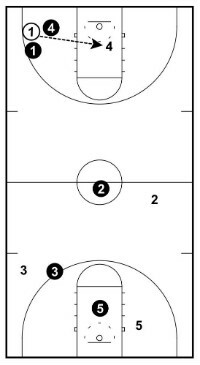 These positions will vary depending on where the trap is set, but in most cases the forward pass must be covered (x3), the last defender will stay in the paint to protect the rim (x5), which leaves x2 to anticipate the pass to o4 or o2 and intercept it. The jump switch is used when the point guard dribbles towards the middle of the court. It occurs based on the thought that it’s too hard to set a great trap in the middle of the court. A successful jump switch always begins with the help defender being in the correct position. If they’re too far away, it gives the dribbler too much time to make a pass. If they’re too close, the dribbler can make a simple lob pass over the top. The help defender must be close to the midline of the court hedging between their own player and the dribbler. When the point guard starts a speed dribble towards the middle or when the help defender thinks the time is right, they quickly close out to the basketball with their hands up to prevent the easy lob pass over the top. As they do this, the help defender must yell out ‘switch’ or yell out the on-ball defender’s name so that they know to switch. The on-ball defender must then immediately turn and sprint to cover the help defender’s player that they’ve been switched on to while keeping a hand in the passing lane. It’s important that when the help defender decides to jump switch, they commit 100% to it. If they’re too slow to close out, the point guard will have an easy pass to an open player and the defense will immediately be at a severe disadvantage. The goal of the jump switch is to confuse the point guard into picking the basketball up, rushing a pass that results in a turnover, or into committing a traveling violation. Unfortunately, there’s no easy answer you can give your players when they ask this question. There is no perfect time. The best time to jump switch will depend on the skill of the point guard, the two defenders involved, whether the dribbler knows it’s coming, the speed they’re dribbling the basketball, etc. Start by encouraging your players to jump switch when the point guard dribbles with their head down towards the middle of the floor. Then, as your players get more experienced with the run and jump, they’ll develop better instincts and feel for when they should jump switch and when they should stay on their player. One of the most important aspects of a full-court press is knowing when to fall back into the half-court defense. 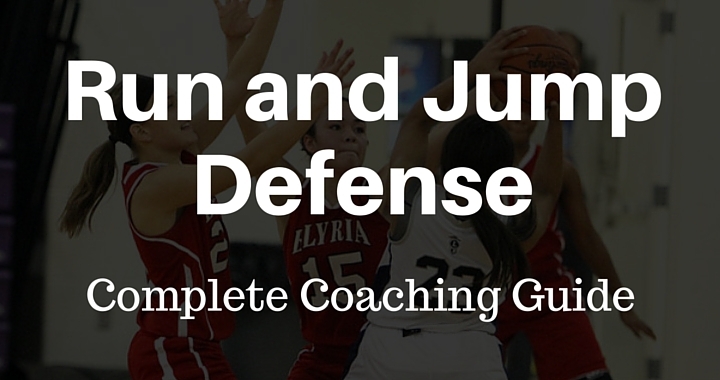 The Run and Jump defense is often a one-and-done trap. After an unsuccessful sideline trap or if the opponent is able to break your press, players must immediately sprint back and protect the paint first and then get into the half-court defense. A hard thing for players is that there’s no specific and clear moment where the players will know to switch to their half-court defense. If the on-ball defender and a help defender are working hard to set a trap on the sideline, the other players stay ready to get in the passing lanes and get a steal or deflection. Occasionally the opponent will break your press. When they do, you can’t allow the offense any easy layups. Any player that slowly jogs back after the press is broken should be sat on the bench immediately. The run and jump defense will never be effective if you don’t have players who are willing to sprint. If you’re coaching a younger team, I recommend getting them to sprint back to the paint before picking up their players. If you’re coaching an older team, your players should sprint back into the correct positions. Similarly to ‘when to jump switch’, your players will get better at making these decisions as they gain more experience running the press. To be successful with the run and jump defense, your team needs to rebound the basketball. One of the benefits we talked about at the beginning of the article is that this defense increases the tempo of the game and encourages the opposition to take quick shots. This means that your players won’t always be in perfect position to box out and secure the rebound. Because of this, it’s crucial that your players are attacking the rebounds with passion whenever a shot is put up. If they have the opportunity, your players should make contact with their player before pursuing the rebound. Your team can also choose to full-deny on the inbounds pass. 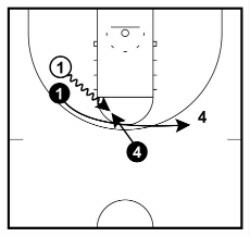 This variation can be implemented if you need to get a steal with little time on the clock, if you’re trying to cause a 5-second violation, or just to change up the defense and see how the opposition respond to it. As usual, the closest player to the ring after a score puts immediate pressure on the inbounds pass. The difference is that the players in the front line must quickly find an opponent and establish ball-side position so that they’re denying the inbounds pass. The defenders further down the court must be defending side-by-side so that if there’s a lob pass over the top, they have the opportunity of intercepting the pass. 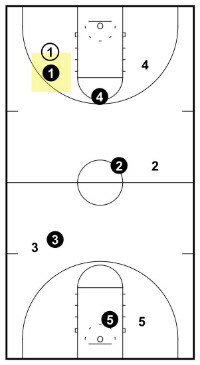 If your players are unable to get a steal on the inbounds pass or cause a 5-second violation, they simply establish the normal Run and Jump positioning. The downside of the ‘full deny’ method is that your team is more vulnerable to screening and players can also get caught out of position if the offense makes a successful lob over the defense or the defender is trailing and the point guard catches the basketball in a sprint. In the main section of this guide, I only talk about trapping on the sideline from behind the offensive player with the first help defender. Another option the defense has is to trap with a defender who’s further down the court. This will usually be the second help defender. 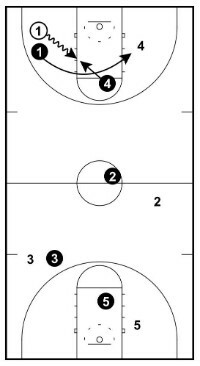 Instead of trapping from the blindside with the first help defender (x4), the second help defender (x2) sees the point guard speed dribbling down the sideline and decides to slide over to cut them off and set a trap with the on-ball defender. When this happens, x4 must drop back and get into position to intercept any pass that is made to 04 or 02. Some coaches prefer this method. Some coaches use both methods. Here are the reasons why I only use the blindside sideline trap. While in a perfect world the point guard dribbling the basketball down the court has their head down in an out-of-control dribble, that’s not always the case. If the dribbler has their head up and is able to see the floor they’ll see the middle defender sliding over and will usually have time to make the correct pass before the trap is set. I’m not saying this trap will never work, but I find the blind-side trap much more effective. If the middle defender slides over, the first help defender has to retreat before getting into a position where they can intercept a pass to either of the two top offensive players. Whereas on the blindside trap by the first help defender, the middle defender is already in a great position to read the pass and get an interception or a deflection. When coaches use both methods of trapping, it’s not uncommon to see both help defenders looking to trap the point guard on the sideline. Even if they both don’t fully commit to setting the trap, if the middle trapper is half-way to the trap before they realize, they’re going to be stuck in ‘no man’s land’ and have no opportunity of intercepting or deflecting a pass. The simpler the better. And I believe it’s more effective to only use the first help defender as a trapper and leave the other three players to read the defense, get in the right positions, and pick off passes. Every so often you’ll come up against a team that have a great guard who makes your defense look terrible. They’re composed, smart, make pin-point passes, and can dribble like few others. They’re the ones that make you question whether you should just drop your players back to the half-court defense for the rest of the game. Do you want to know what to do against star guards like this? Get the basketball out of their hands. Easier said than done, I know… but there are a few strategies you can use to do it. For this strategy, the player who is usually tasked with pressuring the in-bounds pass instead front-guard the player we want to keep the basketball away from. This creates a difficult double team for the offensive player to break free from since the defensive guard is playing behind and stopping the pass over the top. When implementing this strategy, it’s important that the less-skilled offensive guard is left completely open to receive the pass. This encourages the inbounder to make the pass to the less-skilled player which is exactly what the defense wants to happen. 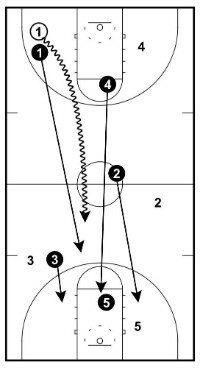 The second strategy is to immediately send a trap at the star guard after they receive the inbounds pass. 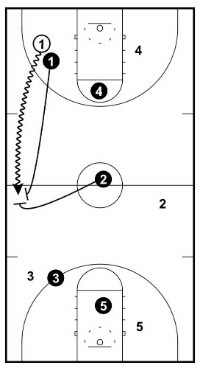 The trap should come from the player pressuring the inbounds pass. When you use this variation, it’s important that the on-ball defender influences the guard to the middle of the floor after the catch by positioning their feet close to the sideline. This allows the second trapping defender to close out and set the trap in a good position after only a few short steps. The goal of this is to get the star guard to pass the basketball out of the trap. This variation doesn’t have to be used solely against star players. You can use this trap at any player at any time as a great change-up to keep the opponent unsure about what your team is going to do. If you’re coaching against experienced coaches, one of the main tactics they’ll use to beat the run and jump defense is to clear out. This means that the offensive team will move all offensive players into the front court except the player dribbling the basketball up the court and the player passing the basketball in. 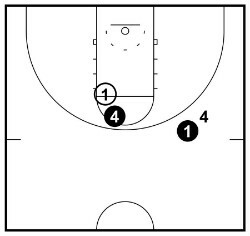 When the inbounder passes the basketball in to the point guard, they’re often instructed to immediately sprint into the front court leaving the point guard in a one-on-one situation. The thought-process behind this tactic is that by clearing out there will be no help defenders to jump switch or to trail the dribbler and trap on the sideline. So what should the defense do when the offense employs this tactic? If the opposition inbound the basketball to their primary dribbler, you can immediately send a double team at them using the inbounds defender to get the ball out of their hands. This will force them to pass the basketball to a player who is usually not accustomed to bringing the basketball down the floor. If they see a clear floor ahead of them and take off in a speed dribble, this can be another great opportunity to push the basketball to the sideline and set a blind-side trap. Even if the inbounder sprints off to the opposite end of the court you can still choose to leave a help defender in the front court. When doing so, every player must rotate up one position so that the player who’s left open is the player furthest away from the basketball. If the dribbler chooses to dribble up the sideline, the help defender trails and sets a blind-side trap as usual. If they dribble towards the middle of the floor, the help defender can close out with high hands and force the dribbler to make a tough pass or pick up the basketball. 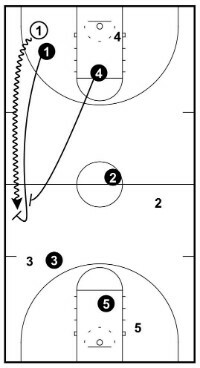 It’s super important that if the press is broken, the two players in the front court sprint back and find a player since the other three defenders will be at a disadvantage. This tactic is very effective in youth basketball since the player with the basketball often can’t make the long pass over the top to the open player. It’s super important that your defense stays unpredictable so that the offense doesn’t figure the best way to attack your press. You can do this by using a mixture of variations. The easiest way for the coaches and players to distinguish between the different variations is to use colors to identify which type of press to use. When in the white press, players do not trap on the sidelines. Players will still use the jump switch if the point guard dribbles towards the middle of the court, but the help defenders do not leave their opponent to trap. This variation can be useful for young players still learning the run and jump defense to get them experience using the jump switch without the complexity of trapping and rotations. It can also be effective for teams that have been trapping on the sidelines and now want to give their opponent a different look. The opponent will be expecting the sideline trap but it won’t come. This is the normal press described throughout this article. Front defenders start behind their direct opponent, pressure the basketball, and then either trap on the sidelines with a help defender or jump switch when the basketball is dribbled towards the middle. This is the press coaches should use most often. Red can be used when playing against a star guard whose hands you want to get the basketball out of or simply to give the opponent a different defensive look. 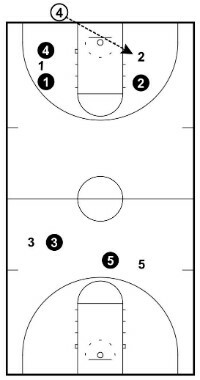 The black full-court press is most commonly used when your team desperately needs to force a turnover, but it can also be effective to keep the offensive team guessing what you’re doing. If you’re going to use the run and jump defense, it’s something I recommend you commit to long-term. You’re not going to see instant results since it requires a lot of decisions to be made by the players during gameplay (which is great!). But it’s a defense that they’ll get much better at as they gain more experience using it. Another thing I love about the run and jump defense is that it’s based on man-to-man principles which is great for long-term development of your players. If you have a team that’s willing to work incredibly hard on the defensive end of the floor, the run and jump defense is perfect for your team.